Back on Themyscira, 15 years ago, Diana gives Steve Trevor a football she made from the skin of the largest boar on the island and they engage in some eventually riparian horseplay that ends with Steve falling into the water and Diana jumping in with him. They get close. Just then, Diana's mother and sisters appear. They scold her for violating their laws and one of the sisters (perhaps not a biological sister) insists that the "little man" must be put to death. Though Diana tries to fight them off, the women are successful in capturing Steve, leaving Diana behind in the shadows. Zip ahead to now. Lois Lane steps onto the roof of an historical building near the National Mall in Washington, D.C. to encounter the mysterious "woman in white" who saved Martha Kent from The Cultists. Lois tries to get the woman to explain who she is and what she wants, but they are interrupted by a pair of attacking harpies. Back at the Mall, Lois and Diana are fighting the harpies and Diana is impressed with Lois's skills. She also reveals some of her identity and admits that she is not invulnerable to "magick and gods," which prompts Lois to mention her fiancée, who can relate. "What suitable mate can there be for a woman as independent and strong as you, sister?" asks Diana, just as Superman arrives and makes quick work of the harpies. Moments later, Steve Trevor and the DEO appear and take official ownership of the situation. But as Diana recognizes her secret childhood playmate, so does Lois recognize a former lover, surprising Superman, who doesn't much show it. Elsewhere, Lord (presumably Felix) Faust, leader of The Cultists, makes a cauldron offering of a henchman's (seemingly one of the harpies) severed hand and renews his pledge to his master to plunge the world into darkness! The mystery surrounding Diana is palpable, despite (or maybe because of) the flashback scenes. The one surrounding The Cultists, however, is trite. I mean, it would have been more mysterious if that guy hadn't turned out to be Felix Faust and we had nothing but the story itself to go on. But fine, these dudes aren't Miller's invention, which anyway is mostly to be expected, and I won't spend much more time than this and the next sentence or two lamenting the use of the name Faust for a stereotypically sinister magic-using type of character. I mean, I'm someone who's read, more than once, both the classic Marlowe and Goethe tragedies, so please just forgive me for being sensitive to the cliché. Plus, Felix Faust was first created back in the 60s, a time when it was probably less of a cliché than it would be today (though still very much one). There's Clark, taking his glasses off at the earliest possible opportunity again - a Clark, I should add, that seems to have been working on his mild manners so much that he's shown earlier with his tongue sticking out in that familiarly earnest, gosh-golly academic kind of way. I get what removing the glasses signifies, but there's also some dude standing right behind him when he does it. It's not like he and Steve are the only two people in the facility. Bah. It's the little things, Smallville, and this probably wouldn't have been noticeable if the glasses hadn't been such a problem on the show. The flashback scenes (analepsis as that smarty-pants T.A. Ewart would say) are very strong, and I believe them completely. Young Diana's dialogue in particular is top-notch. As much as I don't need my super-hero stories to be safe for kids (and do, in fact, prefer them not to be), based on this stuff I'd read a Miller-penned kids-oriented book for sure. 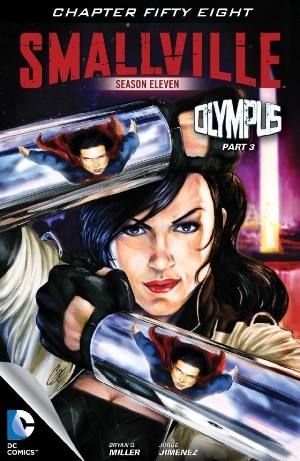 There is a vibrancy to this arc so far that is unusual for Smallville, in a very good way. A lot of it is the art, which has a life of its own, but it's the little things with this, too. (Funny the way that is.) Exposition boxes that no longer intrude, a broad set of circumstances (black magic) that hasn't exactly been confronted before (the Zatanna episodes notwithstanding, which were more about high jinx and tomfoolery than anything, and the stuff from Season 4, which I find to be largely incoherent), a plot that seems to be sustaining its clarity and logic. All good stuff. At least Diana didn't call Lois "amazing." Phew. Otherwise, the line she did have (see the synopsis) was a bit too on the nose, as it were. Having her recognize Lois's strength is classic Smallville and thematically appropriate besides but, for reasons I can't quite put my finger on, I don't believe the older Diana as much as I do the younger one. The spoken formality rings differently from each of them, in a way that seems to give power to the child while sapping it from the adult. Like I say, I can't quite put my finger on it but I'll try and remember to come back to this as the arc proceeds. Ok, forget it. But is this necessary? Does anyone actually want more romantic uncertainty and tension between Lois and Clark, between Clark and anybody? I don't, and it's not because I don't have a perfectly functional endocrine system. If I was into petitions or other efforts to directly influence somebody else's creative process for my benefit, I'd ask Bryan Q. Miller please to let Superman remain oblivious to (more or less... call it disinterested) the emergent Diana>Steve>Lois triangle and whatever mayhem ensues from it until no sooner than the denouement in chapter 12. Ideally, he will not even really notice when Diana flirts with him, which flirt with him, however subtly, she must. Because he's Superman now, right? The Donner Superman, even. "Lois... I never lie." It's pretty much looked that way to me at least since he and Lois shared that look through the window of Air Force One in the finale. And he's committed to her in a "soul mate" kind of understanding, yes? So there are no more SECRETS or LIES between them, or for that matter between him and basically everyone (except for the secret... identity... Blast!)? Point (! ): that's territory more than amply explored already, Smallville. We're ready for something new! Art - 5: I love Jimenez's work but the way he draws especially Clark and Superman in this issue struck me as more than usually like Ryan Ottley's pencils on Invincible and, thus, more than usually unlike Smallville. But technically pretty much flawless and flawlessly expressive, so really, what do we care?